Sikandar Mufti is a drummer and percussionist who has been a part of Pakistan’s music community for over fifteen years now. Sikandar, first inspired by the drumming of Led Zeppelin’s John Bonham, taught himself to play the drums as a teenager and soon found himself playing for what is now known as one of Pakistan’s most notable underground bands of the time; “co-VEN”. He was also hired as a multi-percussionist for Coke Studio’s highly respected and praised House Band. He has since taken part in three seasons of this world famous music show. Most recently he recorded with co-VEN on the band’s first attempt at using the Urdu language entirely in a song, “Chor”, which was launched along with another controversial three-edit video. 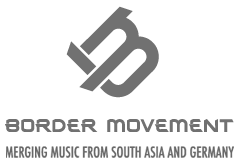 Border Movement is a common initiative of the Goethe-Institutes in South Asia.